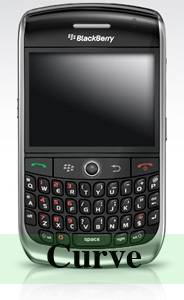 Blackberry is a brand of smart phones that are geared towards the business oriented crowd from RIM (Research In Motion). They have started the trend on push email on mobile devices and have been the leaders of the said technology from its advent up to the present. The version of blackberry that were put out have constantly evolved from the monochrome display of the first blackberry smart phone to colorful smart phones of today that do more than send and receive emails. Two of said devices are the blackberry curve and the blackberry bold. The blackberry curve is a series of devices, two of which has already been released while the third is to be released late 2009. For the purpose of this comparison, we would use the 8900 which released on February 2009, a few after the bold was released. Although the curve was release later than the bold, some features of the bold are still superior to the curve. To compare, the blackberry curve has the best camera that was ever featured on a blackberry, with a very high resolution of 3.2Megapixels compared to the bolds 2Megapixel camera. Aside from that almost all their features are basically the same, they even look the same. But there is one great feature that was lacking on the curve; it has no 3G support. The curve only has GSM and EDGE support and as such, is severely restricted in terms of data speed when not connected to a Wi-Fi network. The bold, on the other, has quad band GSM support along with 3G and HSDPA capabilities giving it a maximum speed of 7.2Mbps. When connected to a high speed HSDPA network, the bold can be up to 100 times faster compared to the curve in retrieving data. It might be good to take note of a few snags that hit the bold during its release though. Software issues delayed the release of the bold for some time and heat issues also appeared in units that were sold in Japan. Although it has not been observed anywhere else, proper caution should be exercised especially when charging your bold. The addition of a high resolution camera doesn’t make up for the fact that the curve lacks 3G support, more so since the blackberry is meant for businessmen. Therefore in this comparison it is safe to say that the bold wins by a large margin. Maybe the release of the third version of the curve would change things up. Ben Joan. "Difference Between BlackBerry Curve and BlackBerry Bold." DifferenceBetween.net. February 20, 2011 < http://www.differencebetween.net/object/difference-between-blackberry-curve-and-blackberry-bold/ >.